Though it would have been wonderful to not have had to wait 12 years for 2007's awful Food Guide's replacement, beyond how long it took, there's not much to complain about the 2019 edition and there's much to praise. 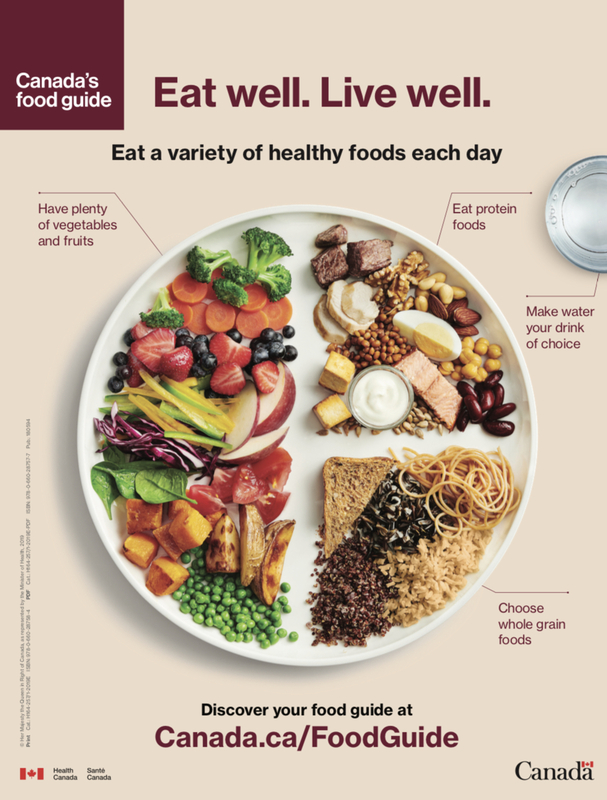 Whether it was consequent to past criticisms, or the insulation of the revision process from the food industry, or a change in leadership, or some combination of those and more factors, the 2019 Food Guide is incredibly different from all of its predecessors. Gone is dairy as its own food group (that doesn't mean the guide is recommending against dairy consumption), gone is wishy-washy language that excused refined grains, gone are explicit recommendations to consume 2 glasses of milk and 2-3 tablespoons of vegetable oils daily, gone is overarching fat-phobia, gone is juice being a fruit and vegetable equivalent, gone is the notion that sugar-sweetened milk is a health food, and gone is an antiquated nutrient-focused approach. Regularly consume vegetables, fruit, whole grains, and "protein foods", where protein foods include everything from legumes, to nuts, to dairy, to meat, and where the guide suggests you consume plant-based proteins more often. Now you may read those recommendations and wonder where the granularity is? How many servings should I have? Which foods precisely should I eat? The thing is, we don't really have granular evidence of eat this food, not that food beyond the broad recommendations noted above. And servings wise, first off, everyone is different in terms of their needs, but more importantly, prior guides' emphases on servings were a known point of confusion - one that both the public, and health care professionals agreed should go. People don't weigh and measure their foods, and consequently, people tended to underestimate how many servings they were consuming, all the while being spurred on by the food industry to eat at least a certain number. Though it's possible that in some of the ancillary collateral published in the future (there will be a steady trickle of food guide related materials being published over the coming months), there'll be a more specific calculator, not having prescribed numbers of servings in the guide, and instead steering to a more healthful pattern of eating seems both wise and appropriate. It also allows for a much wider variety of diets with differing percentages and types of proteins, carbs, and fats (something those geared up to be furious because it doesn't espouse their particular diet over all others might want to reread). And of course there's more than just a short document that outlines and supports those aforementioned recommendations, as also released today was the 55 page long Canada's Dietary Guidelines For Health Professionals and Policy Makers and it serves to flesh out the above and provide their rationale and evidence. No doubt there will be complaints. Dairy champions will clearly be quite unhappy, as will those who are pushing meat and saturated fat as health foods, and my guess is, given there's strength in numbers, people upset about those two issues will likely support one another. 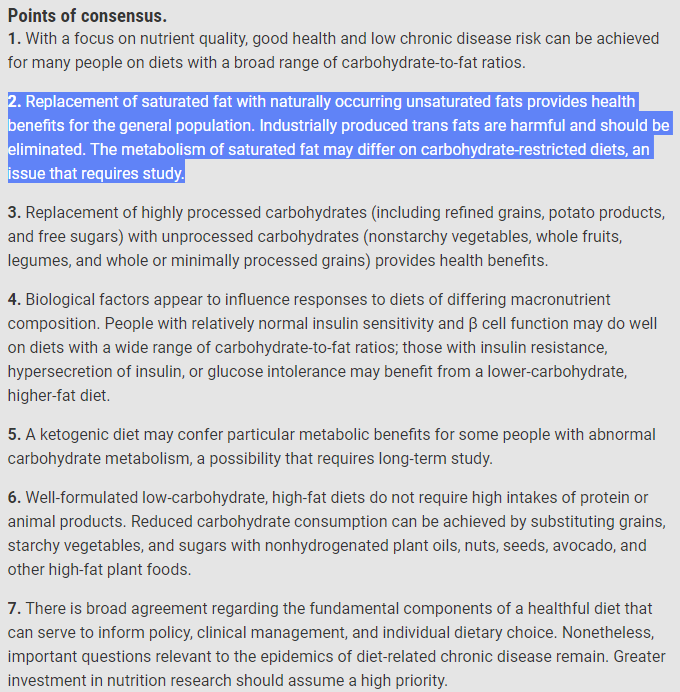 Here I'll simply remind you of the consensus piece on dietary fat published recently in the BMJ that concluded, with prominent low-carb researchers Drs. 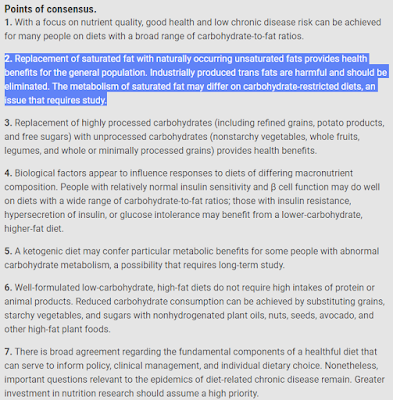 Ludwig and Volek's approval, that just as the new food guide recommends, "Replacement of saturated fat with naturally occurring unsaturated fats provides health benefits for the general population." And remember too, science isn't a static set of facts, it's our best interpretation of data, and it can and does change over time. Will we see future research into the impact of saturated fat on health in individuals following low-carb-high-fat diets lead to a specific mention that on those diets it's less of a concern (or not at all)? Maybe. Maybe not. We're just not there yet. Our new food guide is a giant step forward and those responsible should be justifiably proud of themselves. 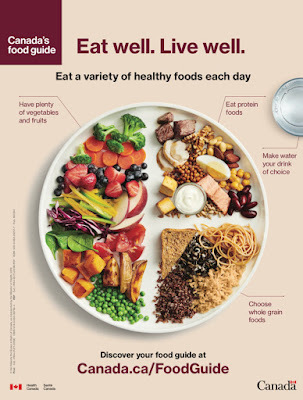 Stay tuned the next few days for posts on why the food guide matters even if the majority of Canadians literally never look at it, its policy implications, and where there's room for further reform.